Isn't It Ironic, and Mercury is in Retrograde-WHAT TO DO! I feel like i'm telling the teacher why my homework is late for some reason. :) i find it simply hilarious that my internet at home (both cable modem and then the airport) have been down since Sunday. I am FINALLY back up, and have received some emails with questions from you guys, and I will be answering them tonight. Thanks for sending them in, keep 'em coming! 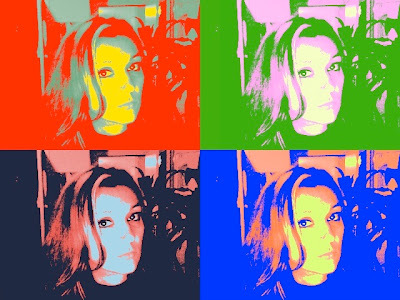 Lastly, to get off the Hippie Chick kick, I will resume procuction on the Podcast and respond to your questions tonight. Ok, so I know that I wasn't going to blog this weekend because I'm working on the Podcast, but I just caught up on the latest episode of Heroes (which I'm officially and unexpectedly obsessed with) and I just HAD to say something. (By the way, if you haven't watched the last episode, this might be somewhat of a SPOILER for you, so don't read any further!!) I was just thinking that if I could be a hero, I would want the same power the latest new Hero had...the power to connect to the internet and satellites just using her brain and without a computer. How cool is that? I realized that when I was thinking about it today, that it was quite possibly the GEEKIEST power one could have, so sharing my little thought would somehow be appropriate here. LOL. 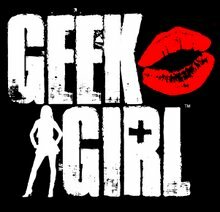 This weekend is going to be filled with lots and lots o'testing and learning for Geek Girl! I am in the process of creating a test video Podcast and hopefully will post it by Monday to see how it works with this Blog tool. Stay tuned! I'll need all of YOUR comments and feedback in order to create the most helpful, informative Podcast EVER. (Ok, not EVER, but close). Post your topics, questions and suggestions in the COMMENTS section or email me at geek.girl@earthlink.net. To those of you who have already emailed me, thanks for the feedback!! For the rest of you, let's talk! Ok, so i can't tell you guys enough how many people I get asking me daily for help with their iPods. On the video podcast and throughout this blog, there will be plenty of help, tips, tricks & accessories that fall under the fun & wonderful category of "All Things iPod!" So, today's tip is a simple one about how to reboot your iPod in the horrible event that it crashes, freezes, or starts to act up. Before you run wildly to wait in line at the Genius Bar at the Apple Store, try the following steps first. So I want to put out a call to all of YOU bloggers and geeks out there for your suggestions, tips and questions for future posts and the podcasts that are in production RIGHT NOW! Also, I encourage you to all any alternate suggestions (or corrections) in the COMMENT section, especially in regards to equivalent PC options for completing the tasks we talk about here. (I know, I know, being a Mac Geek Girl, I can't believe I'm asking for PC help either! But it's for YOU guys!) Or, you can always email me at geek.girl@earthlink.net. That's All for Now, folks! Stay tuned for more! Today's post deals with a HUGE pet-peeve of mine. HUGE. (In fact, I'm going to tag it under Pet-Peeves for future reference; I'm sure that a few more will pop up in the future ;). The tip & pet-peeve is this: people who insist on emailing you photos and clogging up your email because they don't know how to reduce the size of the jpeg. Has this ever happened to you? I'm sure it has. Like when, say, you log into your email software and it spends about 5 minutes "thinking" about the "Send & Receive" function. And then when all of the emails finally come through, you realize that your sister-in-law has sent you ten 2 MB each pics of your nephew. (and they are all always unfailingly the same shot of the kid). People, there is a way to share your pics with friends and family and not infuriate us. There are actually a few options. The first option is one that I would recommend if you don't have any sort of image-editing software (such as Photoshop). Set up a free account with Shutterfly or Flickr or Yahoo!Photos and this will then allow you to create online albums of your images and send a simple, tiny LINK of those albums to your family & friends. These sites also let you organize the photos how you want, create fun little borders & captions, and people can view them as a slideshow on their screen. 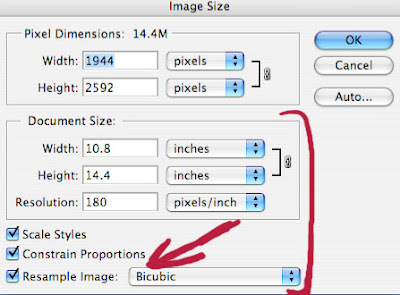 Make sure that you have the "Constrain Proportions" option checked, and you should also check "Resample Image." This will make sure that your image will not be distorted horizontally or vertically; it will only allow the software to change the density of the pixels within the image and it's overall proportions & size. 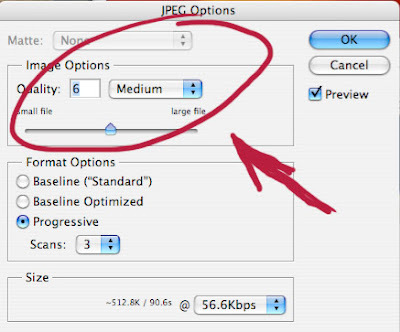 Then change the resolution to 72 pixels/inch (this is all the resolution you need to view properly online and create the smallest file size). You can also change the actual dimensions to make them smaller, and at the same time lower the resolution if you want. Experiment with this and see what yields a reasonable final file size (TIP: check the file properties when the file is closed and saved to see what size it will show up as when you email it and/or upload it). Here you can choose the quality of the final saved file using the slide at the top. Usually even a "low" quality image is just fine for email and the internet. The degree of the quality in this case refers to the file compression when the software saves the image. For anyone who has ever wondered, or even for those who have never given it a thought, I would like to explain two common terms that are used to describe something that you already know exists, but probably never knew that it even had a name. The terms of endearment of which I speak are in regards to typeography, something which is near and dear to my heart (but also something, that when done in the wrong font or style, can drive me absolutely nuts!!). I know, I know, I'm a geek. The first term describes the horizontal spacing in between characters. This is called "kerning." The second describes the vertical spacing in between lines of characters (i.e. 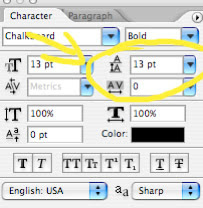 "line spacing"), and it is called "leading." You can usually control both of these measurements depending on what type of software you are using. I am working on an exciting, new, FREE video podcast that will be debuting here soon! Stay on the lookout for it...it will be as fun as it is informative and entertaining.